How Does Bike Share Help? Bike share is a service that makes public bicycles available for shared use to individuals on a short term basis. The bikes can be unlocked from one hub and returned to any other hub in the system or locked to any public bike rack, making bike share ideal for short, one-way trips. You can use them to commute, run errands, visit friends, or casually cruise campus and Westwood Village. Bike share also improves air quality by reducing vehicle emissions, promotes personal health and supports local business. Bike share is a service that makes public bicycles available for shared use to individuals on a short-term basis. The bikes can be unlocked from one hub and returned to any other hub in the system or locked to any public bike rack (for a small fee), making bike share ideal for short, one-way trips. You can use the bicycles to commute to class, run errands, visit friends, or casually cruise around campus and Westwood Village. Bike share also improves air quality by reducing vehicle emissions, promotes personal health, and supports local businesses. Why launch a bike-share system at UCLA? Bike share makes urban cycling easier and safer by providing well-maintained, sturdy bicycles with no ownership costs! Another benefit is the convenience factor: Members of bike-share programs no longer have to account for bike storage and security since all the bikes are locked on public property. Bike share is an emissions-free form of transportation, as well as a healthy and active way to get around. It is best used for short trips, typically between one and three miles – perfect for campus commutes. It can also be used to help people easily get to and from transit stops that may be too far to walk. How does bike share work? Bike share is designed for quick trips with convenience in mind and is typically used for one-way trips (getting from Point A to Point B). Once you join or purchase a plan, you can unlock a bike from any hub in the system, and return it to any other hub in the system or lock to any public bike rack. Do I need bike share if I own a bike? Bike share can still be very useful even if you own your own bike. It saves you the hassle of carrying around a bike lock, finding a place to lock your bike, and it frees you up for one-way trips! You’re no longer tied to your bike at the end of your ride. You’re free to walk, catch a ride back, or use any other form of transportation. Using bike share instead of your own bike can also spare it from unnecessary wear and tear that can be caused by regular city riding. How does Bruin Bike Share work? Bruin Bike Share is available year round, 24/7. We’ve created a special plan for UCLA students, staff, and faculty, so if you study or work on campus, you can sign up for the discounted UCLA plan. The program is also open to the general public. All members will have access to 830 bikes throughout the UCLA campus and Westwood Village, Santa Monica, Beverly Hills, and West Hollywood. Pick up a bike at one of the 135+ hubs located within the Bike Share Connect region network whenever you need one, and drop it off at another hub when you’re done with your ride. Take as many rides as you want while your plan or membership is active. Monthly and annual membership plans include 90 minutes of ride time every day. What is Bike Share Connect? Bike Share Connect is one seamless bike share network, and as a member, you can now ride any bike within the existing bike share systems of UCLA (Bruin Bike Share), Santa Monica (Breeze Bike Share), Beverly Hills (Berkerly Hills Bike Share) and West Hollywood (WeHo Pedals Bike Share). With 830 bikes at more than 135 hubs, you now have access to more bikes in more places with one membership. How old do you have to be to use Bruin Bike Share or any of the systems in the Bike Share Connect network? You must be at least 16 years old to ride Bruin Bike Share, Breeze Bike Share, Beverly Hills Bike Share or WeHo Pedals Bike Share, and at least 18 years old to create an account. How much does Bruin Bike Share cost? There are different options for using Bruin Bike Share. Visitors or casual riders can purchase a Pay-As-You-Go plan for $7 an hour. More frequent riders can purchase a regular monthly or annual membership. Our membership plans include 90 minutes of ride time every day. How are Pay-As-You-Go members billed? Pay-As-You-Go members are charged automatically upon sign up for a minimum of the first hour of ride time ($7). You may choose to preload additional ride time onto your account. However, this is not necessary as any ride time over the initial hour is billed at $0.12 per minute. You may see two charges on your account: One for the initial preloaded ride time ($7), and if you ride for longer than the preloaded ride time, a second charge for any ride time over that preloaded amount ($0.12 per minute). Out-of-Hub fees ($2) are deducted from your Social Bicycles balance or charged to your credit card. Out-of-System fees ($20) are deducted from your Social Bicycles balance or charged to your credit card. Can I rent multiple bikes on one account? Yes. However, only the first bike you unlock will be charged under your membership plan. All additional bikes will be charged at the Pay-As-You-Go rate. You can rent up to 6 bikes with one account. For example, if you are a monthly member and ride 30 minutes with a friend on your account, you’ll use 30 minutes of your daily ride time and be charged an additional $3.50 for the second bike. If you are a Pay-As-You-Go user, all bikes rented will be charged at the same rate. Where can I ride Bruin Bike Share? Like regular bikes, you can ride on most areas of the UCLA campus including designated bike routes and bike lanes. However, riding through campus dismounts zones such as Bruin Walk is prohibited. If you have to ride on sidewalks and campus pathways (aside from the dismount zones), please check your speed and be mindful of other pedestrians. When riding a bike in other parts of the regional bike share network, be mindful of local laws and dismount zones. What is a hub, a rack, and a kiosk? A hub is the row of bikes that can be found throughout the UCLA campus and Westwood Village – there are also hubs in Santa Monica, Beverly Hills, and West Hollywood bike share systems. Each hub consists of a variable number of bike racks. We have a team of bike technicians who keep them stocked with bikes. A rack is the structure that holds each individual bicycle. The bicycles are locked to the racks with a U-lock and must be unlocked using a membership card, account code or phone number and a PIN number. Don’t leave the U-lock behind! A kiosk is the structure located at 16 of the hubs that contains a touchscreen to buy a membership on the spot. Where are the Bruin Bike Share hubs? The hubs are located throughout the service area, which includes UCLA’s main campus and Westwood Village, Santa Monica, Beverly Hills and West Hollywood. You can expect to find the hubs near transit stops and campus destinations such as the Ronald Reagan UCLA Medical Center, Powell Library, and the Court of Sciences. Here’s our hub map. How were hub locations chosen? There are a number of factors considered when determining hub locations. These include population density and points of interest for students, employees, and visitors; the proximity to existing bike infrastructure and public transit stops; proximity to nearby bike share hubs in order to create a contiguous service area that can be travelled end-to-end with relative ease and speed; and compliance with campus guidelines. Can I ride outside of the service area? You can ride a bike outside of the service area. However, if you end your ride and lock your bike outside of the bike share service area, you will be charged a $20 out-of-system-area fee, regardless of whether you had planned to bring it back. To make a quick stop outside of the system area you can put the bike on hold, then lock it using your U-lock. This will continue your ride time but avoid the $20 out-of-area fee. You’ll have 60 minutes before your hold expires and your rental automatically ends. How many bikes & hubs are there? As of April 2018, Bike Share Connect has 830 bikes and 135+ stations which includes bikes and stations from Bruin Bike Share, Breeze Bike Share, Beverly Hills Bike Share and WeHo Pedals Bike Share. Check out our hub map; it’s updated in real-time so you always know where the nearest bike is located. Yes. The Social Bicycles mobile app is available for Android and iOS and allows you to review hub maps, as well as information related to your account. When signing up, be sure to choose Bike Share Connect as your network and select your plan. How do the bikes work? The bicycles are “smart” bicycles (not electric) designed for easy riding in an urban environment. The bicycles are comfortable and can adjust to accommodate all riders without tools. Plus, they feature flat pedals, puncture-resistant tires, and a kickstand for convenience. Every bike has eight speeds, a bell, front and rear automatic lights, and a handy front basket. The bikes have real-time GPS so you can always track your ride and find available bikes and hubs near you. The bicycles were built to fit people of all sizes and heights. There is a lever at the bottom of the seat post that allows you to adjust the seat up and down. They comfortably seat anyone from 4’11” to 6’6”. How do I unlock a bike? First, you need to sign up via the BruinBikeShare.com webpage, a kiosk or the Social Bicycles app. Once you sign-up for the Bike Share Connect network, you will be given an account number and PIN. You will use these numbers to unlock the bike from the hub. Then, find available bikes on the hub map or Social Bicycles app. Once you’re at the hub, choose an available bike and start by pressing any key. If you have a membership card, tap it on the keypad and enter your PIN number. You can also unlock the bikes with your phone number and enter your PIN number. Otherwise, enter your account number and PIN on the keypad. Remove the U-lock, slip it in the holster on the left side of the bike, and have a nice ride! How do I unlock multiple bikes on one account? Enter your account number and PIN into the back of each additional bike that you want to rent, and agree to the Terms and Conditions presented on each bike’s screen. Remove and holster the U-lock on the left side of the bike. You can unlock up to 6 bikes with one account. You are not able to unlock multiple bikes using a single reservation. Where do I put the U-lock? After the bike is unlocked, the grey U-lock will separate completely from the bike. You must bring this with you to end your ride. To carry the U-lock safely on your ride, place it in the holster on the left side of the back panel of the bike with the prongs facing toward the ground. All monthly and annual members can use the bike for 90 minutes (cumulative) each day. Take as many trips as you need! You can keep a bike longer, but additional usage fees of $7 per hour (charged as $0.12 per minute) apply after your first 90 minutes per day. Please keep in mind that this is a bike-share program, and is intended for short-term use so that others can utilize the bike while you are not using it. If your bike has not been returned after 12 hours, the bike will be considered stolen. In this case, you will receive a call from a customer service specialist, and a fee of up to $2,000 plus administrative fees may be charged to your credit card on file. How do I return a bike? Simply line your bike up to an open rack at a hub and thread the U-lock through the rack and bike, just like how the bike was when you unlocked it. You’ll know your ride has finished when the screen flashes and a “Thank You!” message appears with your ride stats. If the bike flashes red or beeps, the bike is not locked properly. Jiggle the U-lock until the bike is locked correctly. You can return your bike to any hub and don’t need to bring it back to the hub where you picked it up. If a hub is full, then you can double lock the bike to a single rack or within 100 feet of the hub and you won’t be charged the out-of-hub fee. If there is no hub nearby, then you can lock to any public bike rack using the U-lock lock provided with the bike for a $2 convenience fee. Always lock the bike to something sturdy. Can I make a quick stop without getting charged? Sure! Simply hit the hold button on the keypad before you lock up. Putting a bike in hold keeps your ride active, avoiding any out-of-hub or out-of-area fees that you might have incurred otherwise. It also guarantees your bike will be there when you return as your bike could be rented by another member if you were to just lock the bike without pressing hold. A hold lasts for 60 minutes (but you can extend the hold if you need to). When you’re ready to ride again, simply enter your PIN to unlock the bike and continue your ride. Please note that you will be charged for hold time as you are still renting the bike. Please do not use your personal lock on a bike. It will promptly be removed. Each bike is equipped with a U-lock that will travel with you on your journey. 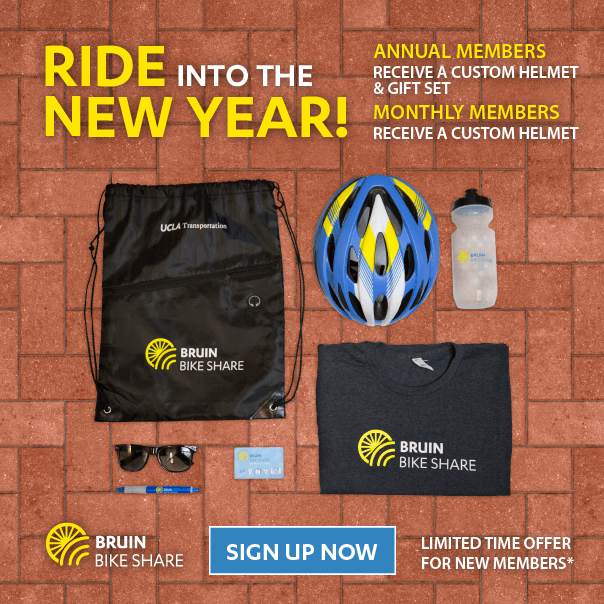 Is Bruin Bike Share owned by UCLA? Bruin Bike Share is owned by UCLA Transportation. It is operated by CycleHop LLC, a company that manages the largest “Smart Bike” bike-share systems in the United States including other Bike Share Connect network systems: Santa Monica’s Breeze Bike Share, Beverly Hills Bike Share, and West Hollywood’s WeHo Pedals bike share. Why can’t I create an account? You do not need to enter your TAP card number to create an account: This is an optional feature that allows you to bypass the “Enter Account Number” screen. You also need a valid credit or debit card. Prepaid cards or cash are not an accepted payment method at this time. Why isn’t my promo code working? If you are an existing member and are trying to upgrade using a promo code, you first need to unsubscribe to your current plan. Then, resubscribe to the plan you want, and apply the promo code at checkout. If you’re a Pay-As-You-Go member, try unsubscribing and resubscribing using the promo code. Still no luck? Contact our customer service team at (855) 206-BIKE (2453) or info@bruinbikeshare.com. My account is frozen. What does that mean? What if my bike is stolen? If your bike is stolen, contact customer service immediately. Note the location your bike was last seen, if possible. What if my bike is damaged or broken? Simply hit the “repair” button on the keypad, and then select the problem (seat, gears, etc). We’ll make sure your bike is taken into the shop and repaired. In the meantime, lock the bike back up and check out another bike. The State of California helmet law requires minors under the age of 18 to wear a helmet. While not mandatory, adults are strongly encouraged to wear a helmet while riding Bruin Bike Share bikes. What if there are no bikes available at the hub? Download the Social Bicycle app to find another bike near you. Because our system uses Smart Bikes, the closest bike might be even closer to you than the closest hub! It could be just around the corner, locked to a normal bike rack. How can you link an existing TAP card to your account?